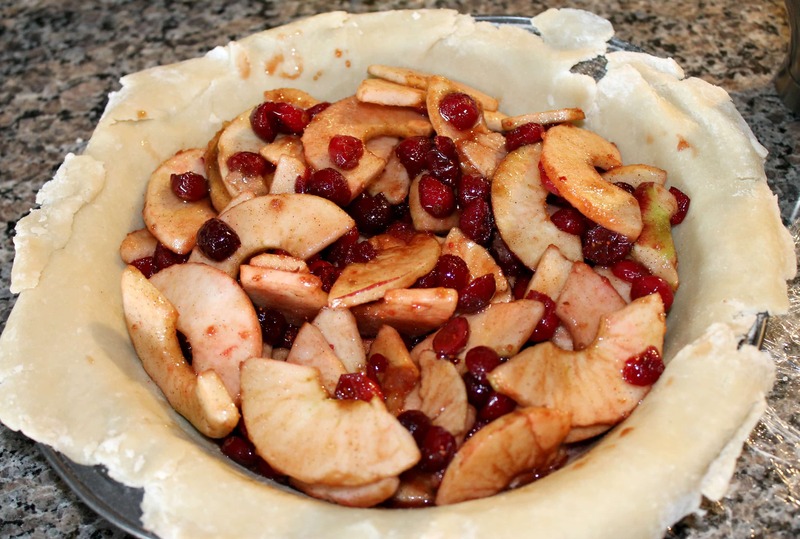 Cranberry Apple Pie Recipe - With Homemade Crust! - THE OLIVE BLOGGER - Recipes your family will love! When you think of a Pie Recipe for the Holidays you tend to lean towards Apple, Pumpkin, Pecan and maybe Lemon Meringue…but today I have for you a NEW favorite that will make an appearance at your table year after year. This Cranberry Apple Pie recipe combines the traditional flavors of an Apple Pie but adds in the tart Cranberries to make a statement that your taste buds won’t soon forget. I was trying to think of other uses for cranberries besides sauce or using it in the stuffing for my Pork Tenderloin I prepared for you guys the other week, and I thought why not use them in a dessert? Just look at that delicious filling guys! It really takes little time to make the filling and if you have one of these funky Apple Peeling Gadgets it really saves you a ton of time and headaches (I have had mine for YEARS and it is just as good as the day I got it). The pie filling uses a handful ingredients and can be whipped up quickly, and it doesn’t require ANY cooking prior to going in the oven to bake…SWEET! Now, for this pie I DID make my own crust…a nice Fall pie like this deserved its own homemade crust, however you CAN use store bought if you want it to be quicker! You can find my Homemade Pie Crust Recipe here, along with my tips and tricks for the perfect crust every time! Check below for the full recipe and remember to save a slice for me! Here is one more just so you can see the full pie in all its delicious glory! This post contains affiliate links, which cost you nothing more but allow you to see what I love to use in my own kitchen! what a gorgeous looking pie! I especially love the lattice crust on top! Thanks so much!!! I didn’t take the time to crimp the edges, but that’s okay it just makes it look more authentic…right?! lol! Ooh love the idea of adding cranberries! Going to have to try this..and go you on making your own crust! Thanks!!! It really is sooo yummy, I love the tartness!!! 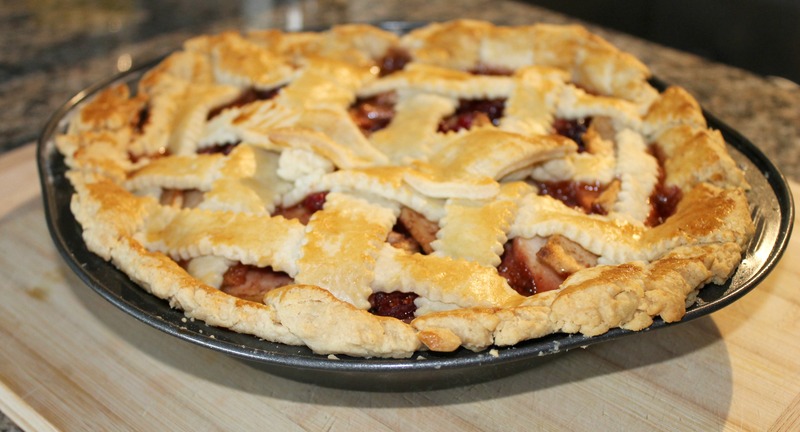 This pie looks delicious and major kudos to making your own crust. I cannot tell you how many times I have failed trying to make a simple pie crust!!! Cranberry apple sounds so perfect for Fall! what a perfect addition to big, family meals, thanks! We loved the flavor combination!!! It is the perfect update to the classic Apple Pie! looks really tasty – i’d love to try this out sometime this season… 🙂 thanks for sharing it! I will be keeping this recipe in mind come thanksgiving. Thats my pie time! I am with you on that one!!! I try to make some spring-summer inspired ones as well to hold me over until the delicious flavors that Fall brings with it! Pingback: Easy Traditional Stuffing Recipe for the Holidays - THE OLIVE BLOGGER - Recipes your family will love! Pingback: Homemade Pie Crust Recipe (Fruit Pies and MORE) - THE OLIVE BLOGGER - Recipes your family will love!